EQUIPMENT FOR PRODUCTION OF THE BIODIESEL IN THE STREAM FROM ANY VEGETABLE OILS OR ANIMAL FATS. Globecore Blending company offers technological lines on production of the BIODIESEL (biodiesel). Biodiesel plants (reactors) made by our company have productivity from 1000 to 16000 l/h, receiving biodiesel from any types of vegetable oil and animal fats. The complex on production of the biodiesel is intended for interesterification of vegetable oil or animal fat, (other oils and fats) by high-disperse mixing with the catalyst and further dry cleaning of the BIODIESEL (biodiesel) to compliance to the European EN 14214 standards and the American ASTM standards. The unique technology allows to make the biodiesel (biodiesel) without long change-over from any kind of vegetable oil, and also fats of an animal origin. Quality of production under the name biodiesel corresponds the European standards EN 14214. All units of a complex on production of the biodiesel are made in explosion-proof execution, from stainless steel. Used accessories of such world brands as "Danfoss", "SIEMENS", "Festo", "Willo", "Bartec", "Cortem", "Wika", "Blackmer", "ABB", "Shneider Electric", "Ent", "GRUNDFOS"
Previously cleared oil arrives in to oil line heater; there it is warmed up to the necessary temperature. The warmed-up oil moves to the biodiesel reactor. Also solution of alkali and methanol move to reactor. At the exit from the biodiesel reactor by hydrodynamic way mixing and reaction of oil, solution of alkali and methanol the crude biodiesel representing mix actually of the biodiesel, glycerin and not reacted methanol turns out. The crude biodiesel comes to biodiesel settler of biodiesel complex, there is take a place water and glyceric phase and its pumping. The remained biodiesel moves on the block of methanol selection where take a place vacuum drying. Final cleaning of the biodiesel is carried out by cleaning block and a complex of filtration. Passing through a layer of ion-exchange pitch, as a result biodiesel is cleared of residual methanol. Mechanical impurity are cleared by filtration system. UNIVERSALITY AND ADVANTAGES OF OUR BIODIESEL EQUIPMENT Biodiesel complexes working based on technology of Globecore has the following advantages: Low consumption of equipment energy. Instant reaction of interesterification. At application of innovative energy saving technology, energy consumption decrease during biodiesel production. The modular principle of complex creation is mobility during the transportation and installation of the BIODIESEL equipment. Effective process of production allows to use small installations. Quality of biodiesel confirms the international standards. There is no waste: the phase of glycerin can be used for various purposes (e.g. generation of energy, fertilizer, etc.) Washing and biodiesel drying, demetanolization is not required; Complexes are equipped with technology of the reactor of continuous action that will allow to increase the speed and quality of interestefication reaction course. By that action qualitaty increase, but also quantity indices of an exit of the pure biodiesel, but also speed of its production. It allows to save energy resources by 5-7 times compare to existing technologies and equipment. The equipment is really simple in operation, high efficiency, and also technological development helps to improve an equipment design, increasing quality and processed raw materials, - reducing power consumption of the equipment, - metal consumption of designs, - increasing its efficiency. Also the equipment is economically effective as doesn't demand big capital investments. LINE OIL HEATER FOR the BIODIESEL (biodiesel). It is intended for oil heating before its supplying to the biodiesel reactor. STRUCTURE AND PRINCIPLE OF WORK OF OIL LINE HEATER Oil line heater consists of three couples capacities connected consistently and located on a welded frame, the centrifugal pump, automatic system and pipelines. In each capacity there is TEN (heaters) block, which consist of six tubular heaters. Oil is supplied through the mesh filter and moves by centrifugal pump in to capacity. There it heats up to the set temperature which is controlled by sensor of temperature, which is installed at the exit from oil line heater. Automatic system at excess of the top limit of temperature disconnects TEN(heaters), and at decrease to the bottom threshold - includes. Pressure of liquid is controlled by manometers on the entrance and an exit of a line heater of oil. For protection against pressure excess the oil line heater is supplied with the safety valve. The hydrodynamic explosion-proof biodiesel reactor is intended for receiving of crude biodiesel by mixing of biodiesel production components. Our enterprise makes biodiesel reactors with productivity from 16 m3/hour to 116 m3/hour, depending on needs of the customer. All accessories, pipelines and fittings of the biodiesel reactor, adjoining to operation body and made from corrosion-resistant materials.The design of the biodiesel reactor provides possibility of control and regulation of mixing process and adapted under various types of oils. STRUCTURE AND PRINCIPLE OF BIODIESEL REACTOR OPERATION. 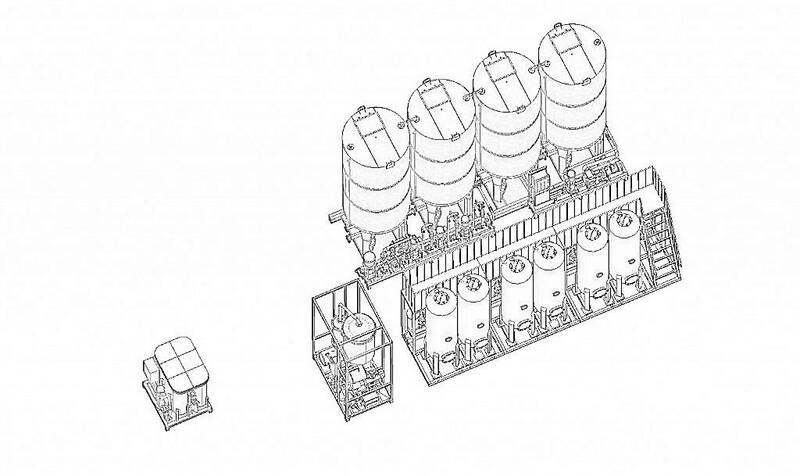 The biodiesel reactor consists of the main and several additional sections of mixing which are collected on frame. The prepared components move through flow meters by pumps to hydrodynamic mixer. For regulation of given components quantity, the adjusting gates are provided. Control of mixing process of mixing, temperature of the crude biodiesel at the exit from the mixer and finally from the biodiesel reactor is carried out by manometers, vacuum gages and temperature sensors. Depending on oil type and quality there could be a need of additional components mixing. For this purpose in a design of the biodiesel reactor there are additional sections of mixing are provided and consisting of the pump, mixer, regulation and control devices. If necessary additional steps can be used in process or be brought out of it. 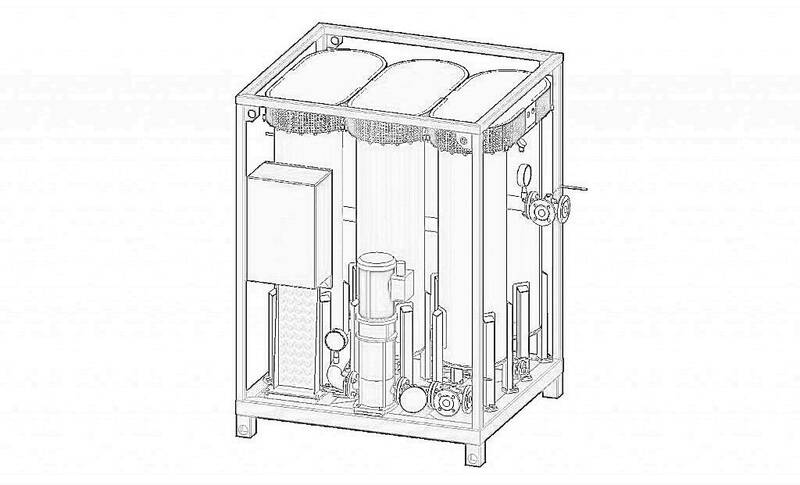 The biodiesel explosion-proof settler with pumping block is intended for defecate of the crude biodiesel for separation of water-glycerol phase; pumping of the divided phases for further processing. MAIN TECHNICAL CHARACTERISTICS OF THE BLOCK OF BIODIESEL UPHOLDING. The biodiesel settler consists of four capacities, collected as separate modules. The crude biodiesel pipeline is brought to biodiesel reactor. Control of liquid streams is carried out from the control panel of a biodiesel settler valves. The crude biodiesel comes to corresponding capacity where settle process is appeared. In the capacities of biodiesel settler level sensors are installed. Control of border level of phases division is exercised by sensors and visually, observation ports are provided. In the course of crude biodiesel settle in the lower part of capacity the layer of a water and glyceryl phase, and in the top - the biodiesel is formed. First of all glycerin, then the biodiesel is pumped out. The block of pumping of a biodiesel settler is built on separate frame and includes the centrifugal pump for biodiesel pumping and its supplying to the methanol selection block. All accessories, capacities, pipelines and fittings which are installed in biodiesel settler and contacting biodiesel are made from corrosion-resistant materials. The explosion-proof cleaning and biodiesel filtration block is intended for cleaning of mechanical impurity and selection of residual methanol. The block of cleaning and filtration of the biodiesel consists of the capacities filled with ion-exchange pitch, filters of mechanical impurity cleaning, the pump compulsory plum and systems of pipelines. For convenience of service the ladder is provided. Biodiesel comes to the consumer after cleaning. All responsible details and knots of cleaning block and filtration are made of corrosion-resistant materials. BLOCK OF METHANOL SELECTION FROM THE BIODIESEL (biodiesel) The block of methanol selection is intended for cleaning of the biodiesel from methanol which didn't react. Biodiesel comes to the consumer after cleaning. All responsible details and knots of cleaning block and filtration are made of corrosion-resistant materials. The block of methanol selection is intended for cleaning of the biodiesel of not reacted methanol. Biodiesel is pumped via the heat exchanger to the block of methanol selection first, after to vacuum capacity from biodiesel settler. Biodiesel heats up in it and passes through deep vacuum cleaning. The extorting pump of methanol selection block supplies biodiesel to the heat exchanger for cooling and to the cleaning and filtration block. The temperature is controlled by thermo sensor. Operational temperature is maintained automatically. Biodiesel level in the vacuum capacity of methanol selection block is controlled automatically by level sensors. Control of foam amount in capacity is controlled by the foam sensor. In case of plentiful foaming the air is supplied through the valve for decrease vacuum level. In the course of methanol selection block operation, methanol vapor arrives in the heat exchanger, there they are condensed. Liquid methanol comes to methanol collector. At achievement of the top level the pump turns on and methanol supplying is blocked. At achievement of the bottom level the system reverts to the original operation. The design of methanol selection block provides possibility of visual control of biodiesel and methanol levels through viewing glasses. Water is used as cooler in methanol selection block, or water solution of antifreeze is used. For providing demanded stage of vacuum on methanol selection block two vacuum pumps are installed. For smoother operation of vacuum system the receiver is provided. After methanol selection block the biodiesel comes to cleaning and filtration block and passes final cleaning. All equipment is collected on welded frame. The main knots and accessories of the methanol selection block are made from corrosion-resistant materials.If you want to reduce expenses of you company for fuel production, “USB” cavitation blending system could help you to do that. To receive extra information contact us and technical manager will call you back or download inquiry list and receive free catalog.